Optical character recognition allows to convert images containing text to editable PDF text format, which supports document text search, copying, edition and all other PDF text functionality. Text recognition can be performed only if it is not locked in PDF document permissions. Page Range Set pages where optical character recognition must be performed. Languages Set language(s) of recognized text. In order to optimize text recognition quality, it is best to choose minimal number of languages. If text recognition is used for the first time, languages list will be empty. To add languages, press Install languages button. 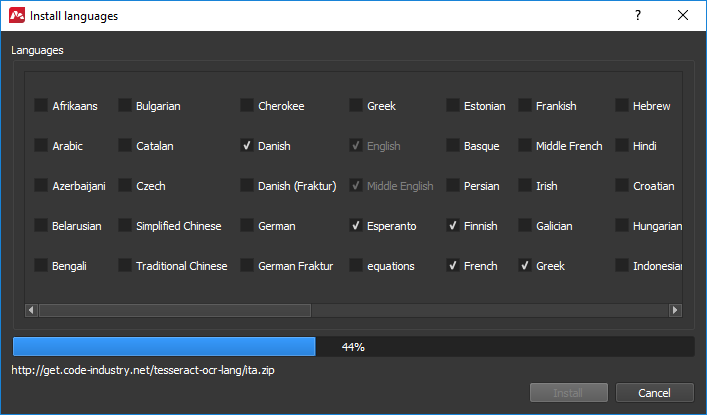 Install languages Check marks to choose required languages. 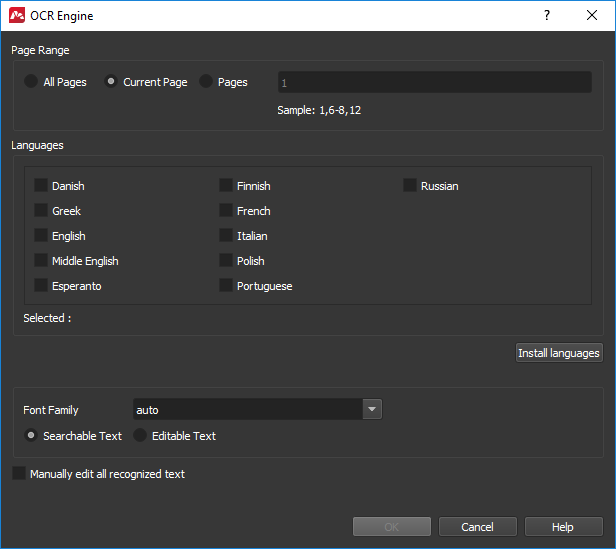 Following window lists languages, which recognition is supported in Master PDF Editor. Font Family Choose font family, which will be used in the document after the text is recognized. When choosing auto, the application will choose the most appropriate font family for current document. Searchable Text If this option is chosen, recognized text will be available for search and copying only. It will be inserted into document as invisible layer under its image. 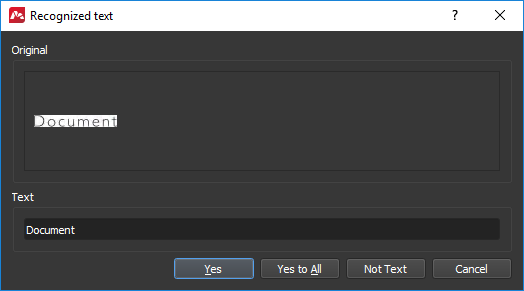 Editable Text With this option recognized text will be available for editing. The text will be inserted in front of the image that contains it. The image itself will be covered with background color. Original A piece of image with text. Automatically recognized text corresponding to the image.The dialogue window will successively show each part of the PDF document image with corresponding recognized text. This allows to edit text before inserting it into the document. Yes Automatically recognized/edited text will be inserted into document. The dialogue window will display next image and corresponding text. Yes to All All images will be automatically recognized and written into the document. This dialogue window won“t appear again during this recognition. Not Text The image does not contain text. Cancel text insertion for current image.